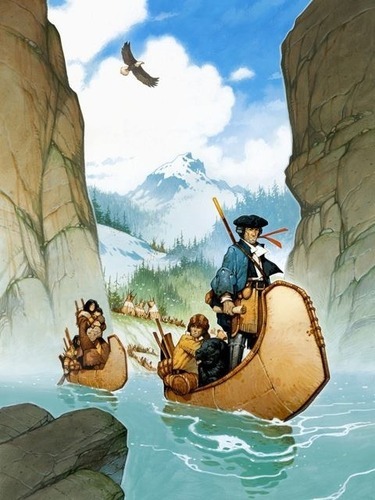 The expedition was commissioned by President Thomas Jefferson shortly after the Louisiana Purchase in 1803, consisting of a select group of U.S. Army volunteers under the command of Captain Meriwether Lewis and his close friend Second Lieutenant William Clark. The duration of their perilous journey lasted from May 1804 to September 1806. The primary objective was to explore and map the newly acquired territory, find a practical route across the Western half of the continent, and establish an American presence in this territory before Britain and other European powers tried to claim it. The campaign’s secondary objectives were scientific and economic: to study the area’s plants, animal life, and geography, and establish trade with local Indian tribes. With maps, sketches and journals in hand, the expedition returned to St. Louis to report their findings to Jefferson. As you can read from the description above from wikipedia, it’s a historical theme game that relive the 2 years mission of Captain Meriwether Lewis and 2nd Liutenant William Clark to explore and map the newly bought territory. And by the looks of it you all might have realize that this is a race game (personally this kind of game is not my cup of tea). The twist to this historical fact is the group is not one but many, which lead to competitive expedition. So each player will lead his / her own group of expedition to journey from St. Louis to Fort Clatsop, and the very first player who finish the expedition wins the game. This is the first game from Cedrick Chaboussit, published by Ludonaute, which can be played by 1 up to 5 players. The game has very beautiful illustration works by Vincent Dutrait, the artist known by his works behind Augustus, Mundus Novus, Diplomacy, Shitenno, Tikal II, The Phantom Society and many more. I haven’t play the game yet, nor see the actual copy of the game in real, so I cannot comment on the components’ quality and the real game play experience. I just have read the rulebook. 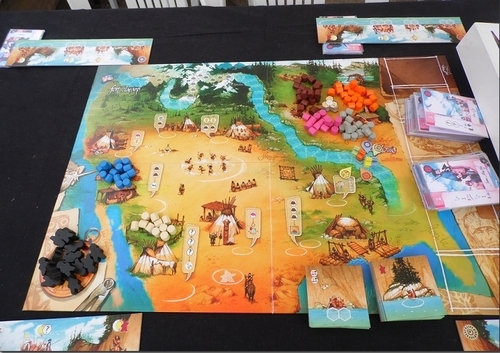 The game has 1 main board, which depicts the whole area of the game (Route tracks, Journal of Encounters, Indian Village action spaces, boat and resource spaces), 5 Expedition boards (one for each player that consists of 5 boats with different specifications), 5 Scouts and Camp tokens, 12 boat tiles, 100 resource tokens in 6 types, resource badges for solo play, 9 route change tokens, 18 Indian figures and 84 Character Cards. The game plays in several turns until one player reach or beyond the finish line (which is Fort Clatsop), and that player immediately wins. Not something that I favor being a race game and all, based on my experience, race game could prove to be anti-climax based on turns and generally predictable in later turns. At first, the competition aspect could be interesting and freshly challenging but once the game progress, the players position could change the game play experience. If you’re last / left behind, it’s hard to keep up with the first and might just probably end the game right there since the positions won’t matter if you’re not winning. 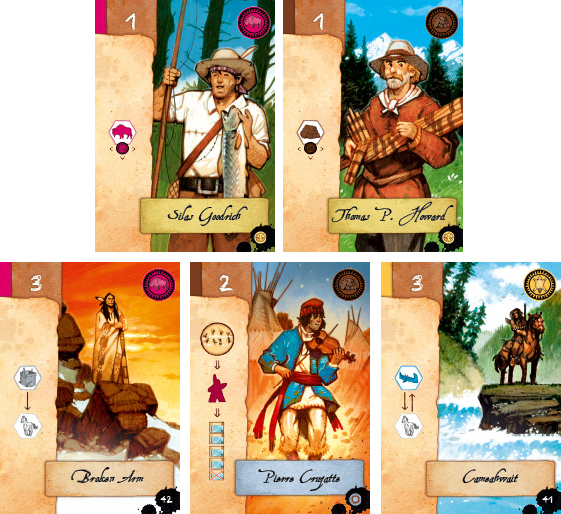 Before the game starts, each player will receive an Expedition board along with his 6 starting Character cards of his color, 1 Indian figure to be placed on 4th boat of his Expedition board, Each resource token of Fur, Food and Equipment (pink, yellow and white) on the 1st boat of his Expedition board. And each player place one Scout marker and Camp token of his color on the starting place of the Route track (St. Louise). One player setup the main board to start the game by placing cards from shuffled deck of 54 cards to the 5 spaces on the Journal of Encounter (sort these drawn card based on strength), place a number of Indian figures beside the game board as Stock based on number of players, place the resources on depicting spaces, place the boat tiles in stacks and place 1 Indian figure in the newcomer area. The game is ready to start. A. Action (this is the compulsory part). There are two types of action: Character action and Indian Village action. Character Actions: By playing a character card from player’s hand into the table. 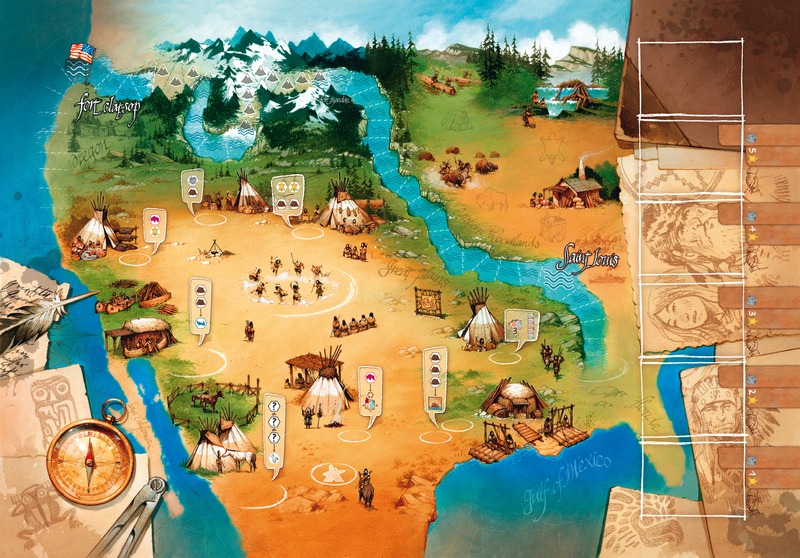 Indian Village Actions: There are several places in the center of the board that can be activated by Indian figure(s). These places have 2 types, a circle and semi-circle. A circle space is limited and blocking to 1 Indian figure, while a semi-circle can be activated with 1 to 3 Indian Figures. These actions cost Strength that need to be paid. Strengths are presented by Indian symbol or figure. For actions purpose, each symbol or figure means activation. One figure can activate a single action of that character’s or village’s. I find the character’s actions interesting, which using the unique mixture of worker placement, hand management, tableau building and card driven mechanics. In order to understand the mechanic of this action, we must look into the card’s anatomy. Each of the card has 2 sides, a character image at front and strength at the back. Character’s image and name. What I like about the game is there are lot of cards with different images and names, each character is limited to one card each. So you can imagine the various characters with their own names. Pretty much cosmetics but I like it. Strength and Cost. At the upper left of the card you can find a number that represents 2 functions (recruitment cost in equipment and strength). In order to get the character card, you need to buy it from the Journal of Encounters. You have to pay a number of furs based on the spaces of that card and a number of equipment listed on the card. This value also used to represents the card’s strength. A character has a range of strength from 1 to 3. Strength is used for action’s activation. Action’s / Character’s benefit. Each card has benefit that can be activated, either by converting resources or producing resource. These symbols describe the character’s benefit. Provided resource icon. In the upper right of the card, there are an icon that the character represents / produces. In the back side of a card you can find another use of the card, which is strength for activation purposes. Character’s strength. The same as the front side’s character strength value but shown in Indian symbol(s). Each Indian symbol counts as 1 strength for activation purpose. Provided resource icon. Just the same like the front. Recruitment discount. When buying a character card from Journal of Encounters you can get a discount by discarding a character card from your hand. This icon represents the discounted resource. Camp time reminder. No significant use. To play a card from you hand into your playing area, you need to pay the cost in either by playing another character card (with back side showing) or using 1 up to 3 Indian figure(s) or both combination of card back and Indian figure(s). Then the action is performed as many times as the strength that activates it. Also as mentioned above, the Village action has either a circle or semi-circle. You can only place 1 Indian on a circle and 1,2 or 3 Indian figures on a semi-circle. Like the character actions, the actions are performed as many as Indian figures placed during that turn (you do not count the previously placed Indian on semi-circle for the activation). Player can set up camp before or after taking an action in his turn. Though it’s optional but the restriction is it’s become a compulsory when a player cannot perform any action (Character or Village). When set up camp, player takes back his Indian figures from playing area, back onto his boats. And calculate how much time the player need to spend in the camp. The amount of time is equal to the sum of the required time cost on a player’s Expedition board and the number of cards left in the player’s hand. This also leads to an interesting management of your Exhibition board and cards in your hand. The time cost will move the player’s scout back in the route track and then move your camp up to your scout if the scout is up further ahead, but if it’s behind the camp, the camp do not move back. At the end, the player takes all his cards in his playing area back into his hand. On one side, having many Indian figures are good to activate actions and stockpiling resource is always good, but on the other side, this could be dangerous for your encampment phase. The time cost will get higher and it will drag your scout further back the route. Player may recruit a character card from the Journal of Encounters before or after the compulsory action. To make a recruit, choose 1 available character out of 5 and pay the equipment cost and a number of furs listed on the space. Or players can discard a card to get recruitment discount. Throughout the game, players will have to collect resources for various uses. 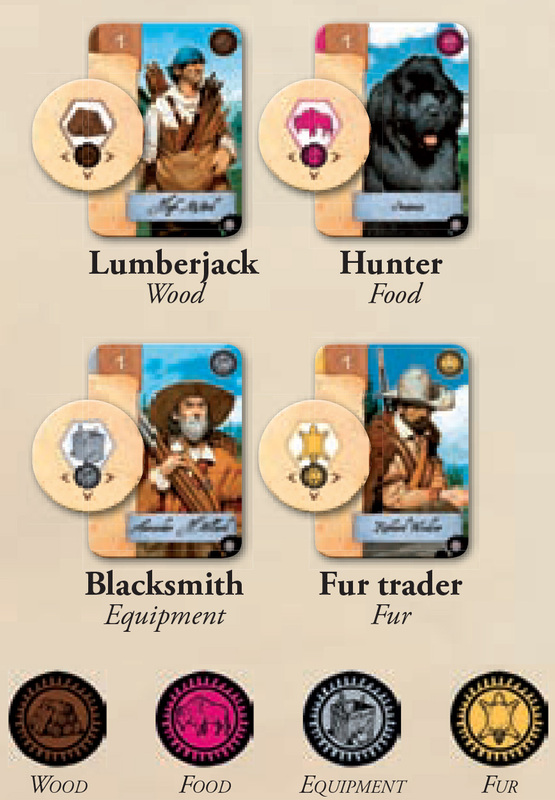 There are several resource types on the game, these are, Wood (brown), Fur (yellow), Pink (Food), Equipment (grey). These are 4 primary resources that can be collected throughout the game. You can find these resources in badge icon and colored wooden tokens. In this aspect, the game offers interesting resource collecting mechanic. Wood can be produced from Lumberjack characters, furs can be produced from Fur trader characters, Equipment from Blacksmiths while Hunter can produce foods. To produce, player can activate a specific character from his hand to his playing area. Once performed, that player gains a number of depicted resources from the supply based on the amount of the badge icon visible in his and his neighbors playing areas multiplied by the activation strength. Pretty interesting right? It has a bit of 7 Wonders feel in it and also this make the action timing more interesting and important. The resources gained must be stored in resource boats’ free spaces. There’s one fiddly note though: players cannot discard previously stored resources to make space for excess resources produced. But player may return stored resources when the resource boats are full. I don’t get it but I am sure the designer has a good reason for this. Canoe (blue) and Horse (white) are not primary resources and are essential in advancing your camp in the route track. To get these resources, players must collect pay / convert some of primary resources or with activating some recruited characters. With this we enter the topic of Movement. Scout’s Movement is the key to winning the game. Players need to move in order to reach the finish line. Movements are broken down by 3 types of terrain, which can be differentiate by the symbols listed on the route track. Those 3 terrain types are River (curvy blue lines), Mountain (grey triangle shape) and Mountain-River (combination of both). These terrains represent movement restrictions for players. In order to move, they need to pay the cost affiliated based on the terrain type. River can only be passed by using Canoes and/or Foods, while Mountain can be only be passed by Horses. By paying 1 Food players can advance 2 river spaces, while with 1 Canoe, players can advance up to 4 river spaces. Paying a Horse let players advance 2 mountain spaces. The mountain-river terrain can be passed with either 3 of these resources. Take IndiansIndians are like workers in this game. You need Indians in order to take actions and to get them you need Interpreter. Interpreter can be recruit at The Journal of Encounters when available. When taking Indians, players gather all Indian figures in the village (including the one on the Newcomer area) into the Powwow location at the center of the village. Players then take as many Indians as they want (players can take all) and place it in boats specifically for Indians. After this action, players discard the most bottom card of the Journal of Encounters and draw another character card from the deck and finally place 1 Indian figure from the stock (if any) to the newcomer area. Another interesting part of this action is left on the timing of action, which this action resulted in vacant circle spaces on the village. Other players then can use these vacant spaces in later turns. You can feel a bit of Tzolkin or Manhattan Project in a fresh way. OverallNow you know about how the game played, you can decide yourself how interesting this game for you. Though it’s a turn off for being a race game but I must admit that many other elements of the game did interest me to place the game into consideration. The function of cards, requirement possibilities open up a large number of strategies in the game. For me (personally) having lots of characters, each with unique faces and names is a plus, also imagining to arrange those resource tokens in the boat’s storage (Oh the OCD in me).